A quirky town just northeast of Phoenix, Cave Creek is an Old West style town where it’s just as common to see horseback riders trotting along Main Street as it is to see a motorcycle cruising by. It’s got that small town charm where locals are friendly and excited to share their town with visitors. With the Sonoran Desert and Tonto National Forest nearby there is no shortage of outdoor adventures to be had. 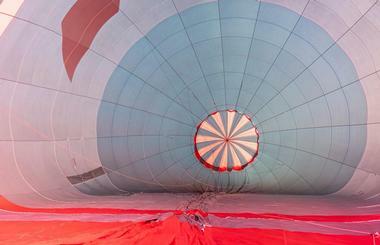 Hiking, mountain biking, horseback riding, and hot air ballooning are a few favorites. It’s also home to several mouthwatering restaurants and numerous unique shopping opportunities. Wild at Heart is a non-profit rescue center for birds of prey. Its main purpose is to rescue injured hawks, owls, eagles, and falcons, rehabilitate them, and then release them back into the wild. But they also relocate burrowing owls who have been displaced, oversee species recovery programs, provide educational presentations, and supervise habitat improvement projects. The rescue center features 54 aviaries and an indoor critical-care room for raptors that need ongoing medical treatment, or just short-term care. Visitors are welcome to tour the center outside of the busy season, May and June. Tours are free although visitors are encouraged to make a generous donation. Tours also need to be scheduled at least one week in advance. The Spur Cross Ranch Trail is a six-mile trail, roundtrip. It cuts straight across the width of the Spur Cross Ranch Conservation Area (one mile) before climbing mountainous Tonto National Forest. At the start of the trail visitors will enjoy stunning big-sky vistas of purple mountains and saguaros before it funnels into a slender trail along Cave and Cottonwood creeks. Along the way they’ll pass by a wide variety of desert flora and fauna including sycamores, mesquites, bobcats, deer, and mountains lions. Considered an out-and-back trail, visitors can technically travel much further than three miles in, however it’s recommended to turn around at mile three, due to numerous washes which are tricky to navigate. Cave Creek Regional Park is an expansive 2,922-acre park located in the upper Sonoran Desert. 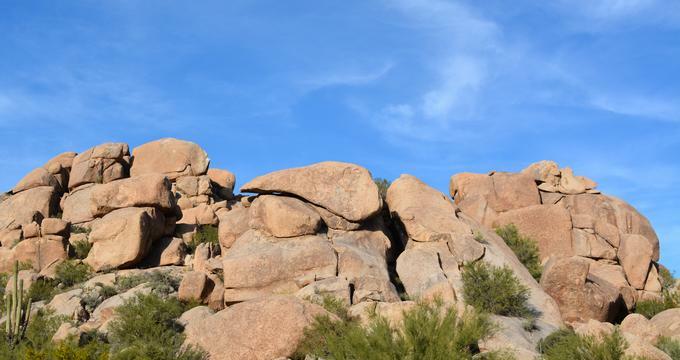 This mostly undisturbed natural oasis provides over 11 miles of joint-use trails, 55 picnic sites, 44 campsites, and sweeping views of the desert in every direction. Trails can be used for mountain biking, hiking, and horseback riding. They range in difficulty from easy to hard with some trails as short as 0.2 miles while others span 5.8 miles. The Slate Trail is ideal for beginners while the Go John Trail is reserved for more advanced hikers, bikers, and riders. Visitors can also partake in ranger led hikes departing from the nearby Nature Center. 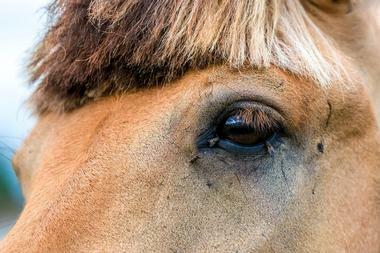 Cave Creek Trail Rides provide safe and memorable horseback riding excursions in the Phoenix area. They offer seven distinct experiences from a one-hour loop tour, ideal for young children to a three-hour tour, perfect for seasoned riders who are a minimum age of ten years old. The latter travels through the Cave Creek Recreation Area along the Go John Trail, it passes through varying eco-systems, backcountry passes, and several mines. Cave Creek features a specialty tour as well, the Historic Clay Mine Ride. This 1.5-hour adventure leaves from the corrals, crosses the mountain, and ends at the historic mine where visitors will then dismount and enjoy a guided tour inside the mine before returning to the corrals. Cave Creek Museum preserves artifacts pertaining to the culture, history, and legacy of Cave Creek, the neighboring town of Carefree, and the foothills area in between the two. This is done through research, education, and interpretive exhibits. Displays in the museum’s north wing feature a replica of a Hohokam house, and several displays of prehistoric artifacts pertaining to the Hohokam and Salado Indians. The south wing focuses on the area’s pioneer life in the late 19th to early 20th centuries including its rich ranching and mining history. Cave Creek Museum also boasts a tubercular cabin, native botanical garden, gazebo, research library, and a restored Historic Cave Creek Church. With an elevation gain of over 1,200 feet, the Black Mountain Trail is a 1.1. Mile footpath that reaches Black Mountain’s summit. The mountain itself is nearly 3,400 feet above sea level so visitors will need to drive almost two-thirds of the way up the mountain to reach the trailhead. Cars can park along south Schoolhouse Road, the trailhead is easy to spot from the road. It’s one of the most popular trails to climb due to its height and difficulty, Black Mountain is one of the tallest summits in the area with a relatively steep incline. Those who reach the top are rewarded with scenic vistas of the surrounding area. Desert Foothills Library was created to foster the sharing of knowledge, culture, and ideas by offering personalized and responsive services, resources, and learning opportunities for the community of Cave Creek. This includes teen and kid focused programs such as college planning and story time. They also provide a digital library as well as a wealth of practical online tools like career resources, jobseeker opportunities, tax information, test prep tools, and reading recommendations. The library is equipped with conference rooms overlooking scenic mountain vistas, a prep kitchen, a botanical garden, and an outdoor terrace with a waterfall and fireplace, ideal for events, meetings, and weddings. Situated in the heart of Cave Creek, Frontier Town offers visitors an old west experience. They’ll feel as though they’ve been transported through time as they walk along Main Street, which is lined with lovely boutique shops. Debra Ortega’s Native American Jewelry & Arts, Happy Hogan Hut Unique Creations, Suzanne’s Hot Stuff, and Udder Delight Milk Soaps & Creams are a few specialties. Home to a gallows and Boot Hill Cemetery, Frontier Town reminds visitors of the wildness of the Old West with public re-enactments like duels. It also hosts several events such as country music concerts, and features a charming white chapel, and an event pavilion perfect for rustic-style weddings. Nestled amidst the scenic mountains of the magnificent Sonoran Desert, Grace Museum of America was started by Grace Voss Frederick. It houses a collection of historic artifacts from significant periods in American History. Her intention for opening the museum was to display America’s “transition from a primitive country to a great nation.” It contains several significant items from the 19th and 20th centuries such as original mannequins and antiques as well as many of Frederick’s personal artifacts collected throughout her life and during her travels. Tours of the museum are guided and feature recorded and live descriptions of the displays, they are roughly two hours long. Located in Arizona’s Canyon de Chelly, in the town of Cave Creek, Massacre Cave is historically well-known for a mass murder that took place in 1805. The Spanish attacked Navajo men while they were hunting. Once the raiding party was seen, the remaining Navajo villagers hid in what is now Massacre Cave. 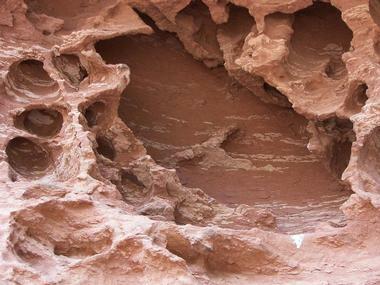 Over 115 Navajo were killed in the raid; the cave itself still bears the bullet marks from Spaniards’ rifles. Today, visitors are welcome to tour the cave and surrounding area including the site named “The Place Where Two Fell Off,” where a Spanish soldier attacked a Navajo woman, which led them to fall into the canyon to their deaths. Bryan’s Black Mountain BBQ is a world-class barbecue restaurant situated in the Old West town of Cave Creek. Bryan Dooley, a Culinary Institute of America graduate and renowned fine dining chef takes traditional barbecue favorites and elevates them with simple touches creating an out-of-this-world result. For example, the rolls are buttered and toasted before succulent pulled pork is sandwiched between them. Providing this subtle crunchy contrast takes the sandwich from delightful to heavenly. Bryan’s is also famous for his signature dish, frog legs sautéed in butter and dry rubbed, it’s a sell-out dish every time. There are even incredible vegetarian options available like his “pulled” spaghetti squash sandwich. Sergio Ladron de Guevara Fine Art is a charming gallery in the heart of Cave Creek devoted to the works of its namesake, Sergio Ladron de Guevara. It is suffused with the breadth of his work from a 64-year career as a professional artist. The walls are covered with fine etchings of some truly magnificent landscapes in Mexico, Italy, France, and the Sonoran Desert. There are also a small number of intricate silverpoint drawings displayed. They gallery showcases both originals and prints of Sergio’s works. A quaint etching studio with two hand-crafted etching presses modeled after those of Rembrandt can also be viewed in the gallery. 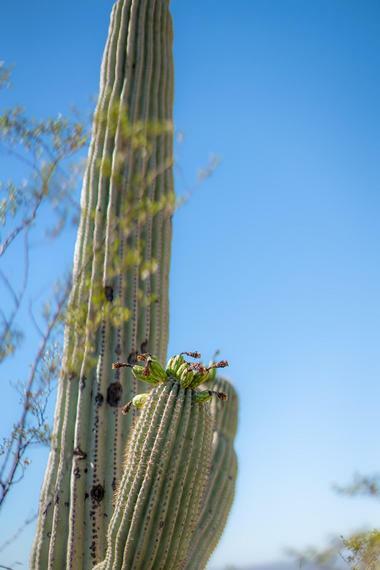 Owned and operated by the Desert Foothills Land Trust, The Caroline Bartol Preserve at Saguaro Hill is 6.2 acre preserve named after the woman who championed its purchase. 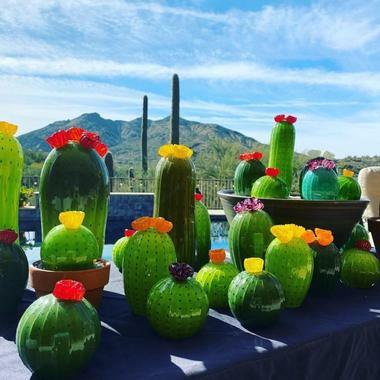 This magnificent hillside is home to hundreds of saguaro cacti and provides stunning, panoramic views of the Desert Foothills and Black Mountain. The preserves feature a short, half-mile interpretive nature trail that begins at the Desert Foothills Library parking lot off School House Road in the town of Cave Creek. Visitors will learn about the life of saguaro cactus and what habitat is needed for them to thrive. The preserve is also home to the Goldwater Memorial and the Richard E. Rudolph Garden. Located in Cave Creek, Johnny Ringo’s Carefree Adventures offers jeep tours of the Sonoran Desert and the Tonto National Forest. Guides are extremely knowledgeable on Hohokam prehistoric Native American ruins, natural waterfalls, archeological artifacts, and native animal and plant life. There are four tour options to choose from, Gold Mine, Above it All, Hidden Treasures of Cave Creek, and Four Peaks Adventure. The latter is a six-hour tour that travels 18 miles through the desert and forest, ending at a mountain known as Four Peaks. Once there guests will enjoy an educational nature walk that stops at Mud Springs before climbing a little higher to get a pretty extraordinary view of Ponderosa pines. 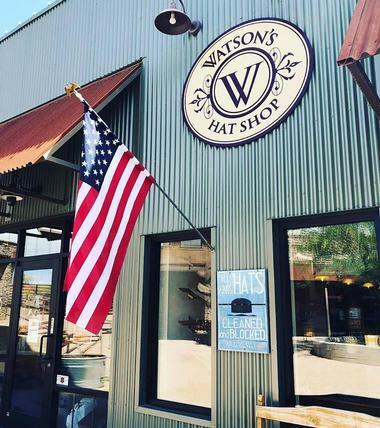 Watson’s Hat Shop is a dream realized by owner and master hatter, Eric Watson. His interest in the craft was sparked when he was just twelve years old. The inspiration? The very fedora Indiana Jones is known for wearing. It was then that he began his foray into the art of restoring fine vintage hats. Throughout the years, Watson had the pleasure of learning from seasoned hatters while also obtaining necessary hatter equipment. Each of Watson’s creations are handmade using 100% USA raw materials, and designed to last a lifetime with the proper care. They make handcrafted fedora, panama, cowboy, and dress hats for both men and women. 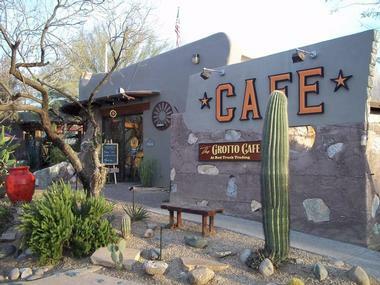 Grotto Café is a family-owned restaurant located in the charming town of Cave Creek. A popular neighborhood spot, it boasts a homey, southwestern style. Antique furniture, intricate hand-crafted wood tables and chairs of all heights, styles, finishes, and bold red-painted walls adorned with oversized menus, vintage posters, magazine covers, and memorabilia create a casual and cozy ambiance. The restaurant’s most distinguishing feature is the outdoor grotto. Surrounded by lush southwestern foliage and equipped with vintage-style, black-wire tables and matching chairs, it’s the perfect place to enjoy their southwest-style breakfast and lunch menus. The latter consists of salads, tacos, cold cuts, and hot sandwiches like the Meatball Marinara. Located in Cave Creek, Tonto Bar & Grill is a modern desert restaurant with a storied past. Situated on land that originally belonged to the Tonto Apache tribe, it was eventually settled by a U.S. Cavalry before becoming the home of the largest and most famous dude ranch in Arizona during the 1940s. Today, Tonto Bar & Grill is housed in a piece of the historic Rancho Manana dude ranch. Retaining much of its original character, the restaurant boasts a southwestern style infused by sandstone painted walls, desert patterned chairs, and magnificent handcrafted wood furnishings. The atmosphere is complemented by the southwestern-style menu offering an eclectic selection of dishes from Tortilla-Crusted Crab Cakes to Root Beer Braised Boneless Short Ribs. Housed in an early 20th century ranch house, Cartwright’s Modern Cuisine is a desert-style restaurant in the charming, old west town of Cave Creek. It features a hacienda-style interior, private wine room, and romantic enclosed patio. Known for its sustainable practices, it uses recycled materials in many of its design elements including straw-packed walls, woodwork from a regional mesquite, slate and sandstone accents, and a wood-burning fireplace in each of its rooms. The menu features dishes made with foraged fruits and vegetables like Banana Yucca and Lobster mushrooms, fresh seafood, Mesquite wood-fired all-natural beef, and local game, as well as house-made desserts and breads. 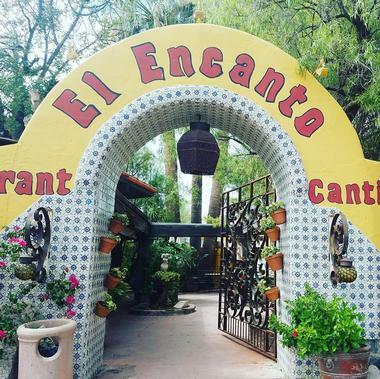 A family-owned restaurant, El Encanto is a beautiful Mission-style property anchored by a large, serene pond in its courtyard. A stunning covered patio decorated with wrought iron and tile-painted furniture overlooks this beautiful water fixture populated by playful wildlife. Home to some slow-moving turtles, cooing owls, quacking ducks, and even a majestic blue heron, diners can interact with these animals by purchasing cups of birdseed from the machine near the water’s edge. A menu of authentic Mexican dishes exquisitely complements the enchanting ambiance with staples like overstuffed enchiladas, tacos, and fajitas. Pollo Fundido is a signature dish made with roasted chicken breast, pepper, and onions rolled in a crispy tortilla and slathered with gooey, spicy, jalapeno-cream-cheese-cheddar sauce. Arizona Balloon Safaris is owned and operated by Randy Long, an accomplished, FAA licensed commercial balloon pilot with more than 30 years experience. Open since 1991, he has logged more than 4,000 flights and personally flown more than 50,000 passengers. Flights launch from somewhere in the Sonoran Desert, the exact location is determined by Mother Nature the day of the flight. They last roughly 45 minutes, typically travel five to seven miles in any direction, and reach heights of up to 5,000 feet above the ground. These trips provide unobstructed 360-degree views of the beautiful desert landscape and include a sit-down champagne breakfast upon return as well as a traditional balloonist ceremony, and a first flight certificate.